As a blogger, the main thing that you probably want is having many RSS feed readers. Remember the 22 steps you must do after setting up a blog? One of the tips in that article was: If you're a member of any forum, place the URL to your blog in your signature and reply to threads. Here is a nice little trick to optimize that signature, showing off your RSS feed. Attract more readers to your website and help spread the world. This technique uses the help from Feedburner. If you already have a Feedburner account, you can skip step 1. With FeedBurner you can optimize your RSS feed. You can also track the number of feed readers and much, much more. Quickly go to Feedburner.com to create a Feedburner account. You'll first have to register at Feedburner. Once you have a Feedburner account, log in. Once logged in, insert your RSS feed in the field with the text Burn a feed right this instant. Give your feed a title and an address. Remember your feed address or write it down. It should start with "http://feeds.feedburner.com/". Now your feed can be accessed through your Feedburner address. Don't forget to change the RSS feed URL in your template. Put the following code in the <HEAD> section of your website. Change the FEED_TITLE to your feed title and the FEED_ADDRESS to your RSS feed found on Feedburner. A mini-tutorial using Adobe Photoshop to create a fancy, Web 2.0 signature. There are many other tutorials for Photoshop out there that can help you a lot too. Open up Photoshop and create a new file (Ctrl+N). In this tutorial I'll be using a width of 450 and a height of 120. Of course you can use your own settings. Make sure you use a non-transparent background. Place a box on the bottom of the page with a height of 100 pixels and a width of 100%. If you really want to make it Web 2.0, use a nice gradient to fill the box. To make it universal, use the colors of your website or blog. Now add your logo to the signature. People will recognize this logo when they see it and you can use it everywhere you want to. Give it some effect, like an Outer glow and make it "Pop out" of the background. Add a reflection by making a copy of the logo on a new layer. Go to Edit > Transform > Flip Vertical. Place the copied logo directly beneath your original one. Create a Layer Mask and use the Gradient Tool (G) to remove a part of the bottom. Bring down the Opacity to 30%. Use the header of the image to place your name since it's the first thing (next to your logo) what the viewers will see. You can add a reflection and add some information about yourself. Use the footer of your image to place all other information you would like to share with the world. You can use icons to display the kind of information. Use the font Arial and set the font rendering to none. This will be essential for later. Don't use reflections on the text, but you are allowed to use them on the icons. Also, leave enough space for your RSS feed titles. This is my final result. Save your image as .GIF (CompuServe GIF) and upload it to any server. Let's go back to Feedburner and select the feed that you want to promote. Go to the tab called Publicize and select the Headline Animator service. You can play around with your own settings, but I like to use these. The Clickthrough URL doesn't matter, since we're going to modify it ourselves later in the signature. Set the Theme to "Provide your own Background". The field Background Image will appear. Insert the URL where you uploaded your .GIF background. Press the Load button when you're done. Your background will be displayed at the bottom of the page. Disable the Title and the Dates. This leaves only the RSS feed left. Change the color and other font settings from your feed in the Headlines. Don't forget to change the width to a bigger value like 350, depending on the width of your background. Now drag your "Sample headline from feed" to the desired position and you're ready to go. Give the image a name and click Activate on the bottom of the page. Here are the settings that I used. Copy the full SRC of the image and there you have it: Your own signature showing off your RSS feed by rotation. Here is my final example. Replace WEBSITE.com with your own website, like "marcofolio.net". 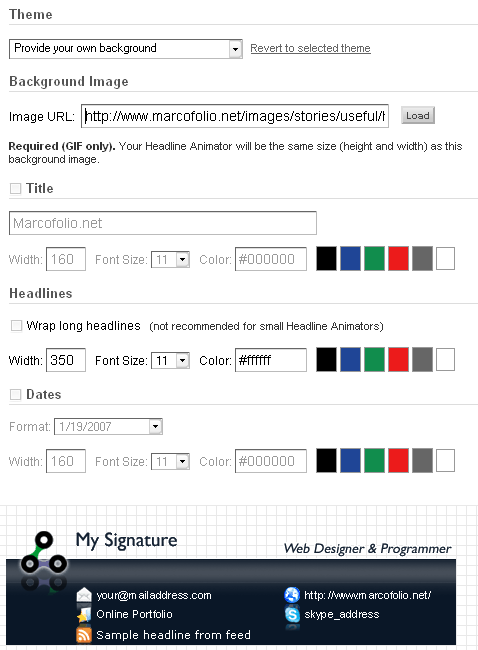 Replace SIGNATURE.gif with your own signature on Feedburer, like "[IMG]". There you have it, a beautiful nice Web 2.0 signature that's promoting your precious RSS feed. Pretty sure that it'll attract more readers. Please take note that you can't save the .GIF image from Feedburner, otherwise your latest feeds will not be displayed. Show off your creations in the comments.